Gabriel Green was just doing a favour for a few volunteers driving along the north coast of Lesbos island in Greece yesterday, when he took his camera out and zoomed in on a large white boat in the Aegean Sea. The volunteers couldn’t locate their binoculars and, to the naked eye, the white boat didn’t appear to have the clear tell-tale signs of being a boat filled with refugees: tiny orange dots. But, to be sure, Green zoomed in and took a picture. Sure enough, Green could see the boat was full of people wearing orange life-jackets. He told the volunteers he thought it was a refugee boat and that there might be around 200 people on the boat. Less than 60 seconds later, he took another photograph (pic 2). 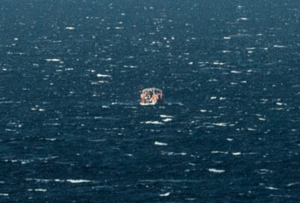 Looking at this second photograph in his viewfinder, it was clear the boat had vanished and everyone was in the water. 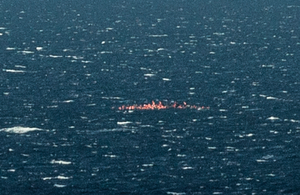 Within minutes all you could see from the Greek coast was bobbing orange dots. At this point, one of the volunteers in the car called the coastguard but couldn’t get through. They called their co-ordinator, who then contacted the volunteer lifeguards from Spain’s Proactiva Open Arms, who then communicated with the Greek coastguard. It’s being reported that two small boys and a man drowned in the incident and that the coastguard rescued 242 people from the water – a figure that, confusingly in some reports, is said to include other boat rescues from yesterday. What would have happened had Green not photographed the boat? How many boats have sunk without trace? As a recent volunteer asked: who’s counting the dead bodies lost in the Aegean Sea? Posted in Misc and tagged boat sinking, lesbos at 10:21 am on October 29, 2015 by Broadsheet. Boat clearly overloaded. Stating the obvious here, but these deaths could have been avoided with the input of some responsibility. Every sinking is as sad as the last one. Yeah, if only human smugglers transporting war-torn refugees could be more responsible!!!!!!! Yeah it’s mad the smugglers quality control didn’t pick up the fact that the lifejackets they sell for hundreds of euro are usually fake and stuffed with sponge either. Should look into ISO accreditation. I doubt reason and rationale are at the forefront of someone’s mind when they’re fleeing for their lives as fast as they can. Hi Spaghetti Hoop, you’re right, pretty much all of the boats that arrive are overloaded. That’s the point. Refugees who’ve arrived in Lesbos have told me that when they felt the situation was dangerous and said they wished to wait, smugglers held guns to their heads and they were made to make the journey regardless. Your note from yesterday were truly shocking. 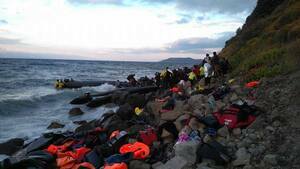 Has officialdom on Lesbos collapsed or is the scale of the problem overwhelming the people there? I was curious if there were groups like red cross or other NGOs in place? Jesus. Imagine realising what you thought would be your salvation has turned out to be potentially fatal and *still* being made to go through with it. No time to process despair as a new terror takes hold. Then why pay for the privilege of either dying by shotgun or dying by drowning? There are refugee camps set up now. The risks of crossing the Aegean must surely have been communicated effectively, no? There are facebook sites and other means of communication that are set up by the people themselves telling others how to best go through each step on their journey, including the boats. But if what they are willing to face is better than what they are running from, what they are running from must be hell. Forgive me but that sounds terribly complacent. Refugee camps can be really horrible places, there are no opportunities for you and your family, they have outbreaks of disease, no schools, little healthcare etc etc. We are lucky we aren’t in the position of choosing that or possible death, but a better life for our families if we make it. ….and keep the smugglers in business. There will always be people who take advantage of any situation, a**holes be a**holes. But should they stay in camps rather than pay smugglers because they are bad people? I really don’t think any of us can make a judgement on this because we aren’t in that position. It’s very easy to pass comment when we are messing around at work in our nice safe stable countries. 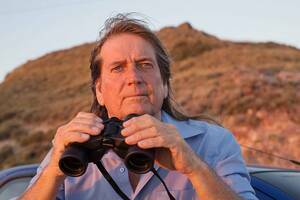 We have no idea what they are running from and what state the find themselves in once they do. Ah Hoop. I thought you were better than this nonsense. Don’t images of European NGOs and naval services picking people up from these boats and dropping them off in Europe cause people to risk this in the hope they’ll be picked up too ? Eye popping data visualization here of the scale of the migration, where they are coming from and where they are going to. That is… I honestly don’t know what to say. Thanks for posting. Pretty interesting site. I question double counting on arrival into Europe, but don’t expect that would greatly influence the figures. Can we see about getting that posted on Britain First’s FB page? Should give them a nice scare ala ‘there is nothing you can do’. Saying Allah to Britain First is enough to give them a heart attack let alone a scare. Vice are doing a some news pieces and documentary shorts about the refugee crisis. They are all worth watching. Why would they take the risk when they know how many have died? I’d recommend looking at any of the vice vids to give a small taste of what these people are experiencing and what drives them to this level of desperation. As does Russia: Ba’athist Syria is one of Putin’s client states. but Russia didn’t highhandedly foment and fuel the civil war that has plunged the region into chaos. As a right-wing authoritarian – according to all those political spectrum tests I’ve taken – I have to doff my astrakhan cap to Pooty-Poot: he is the caudillo’s caudillo and yet rarely attracts the amount of animus that plagues Western leaders. He’s the Macavity of hard power. Who are captaining the boats? Are they making one way journeys or do they hope to sail back and make the crossing again with more refugees? 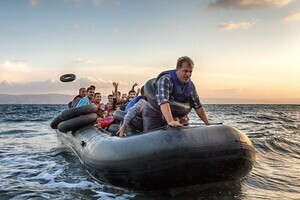 Are they being forced to by gunpoint also, or are the smugglers just buying boats and teaching the refugees to sail it and leaving them to it? I’ve so many questions.